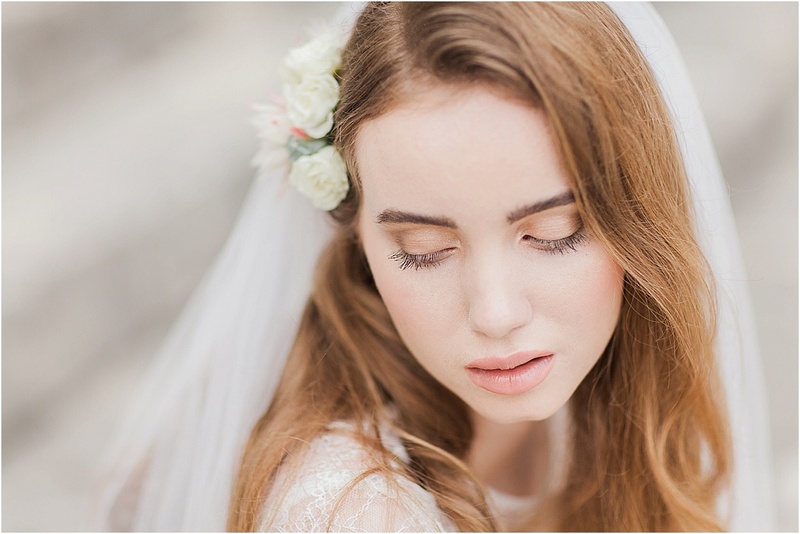 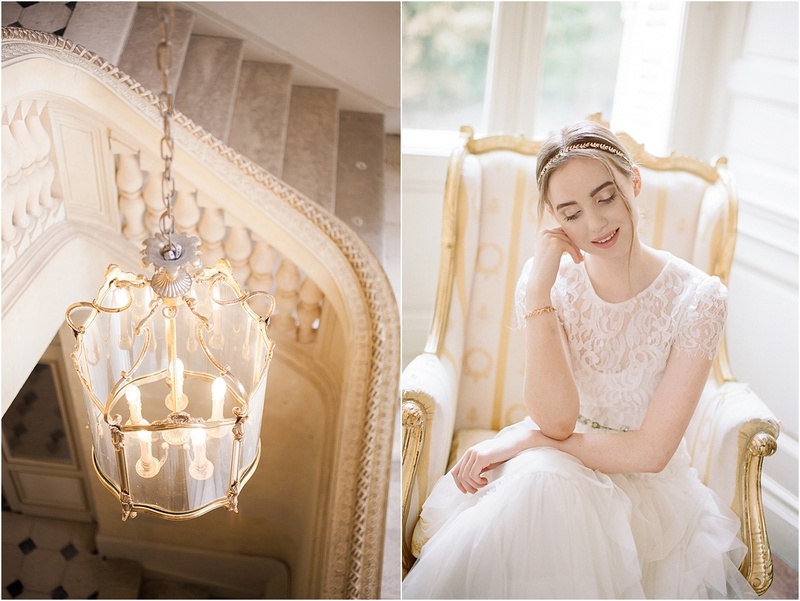 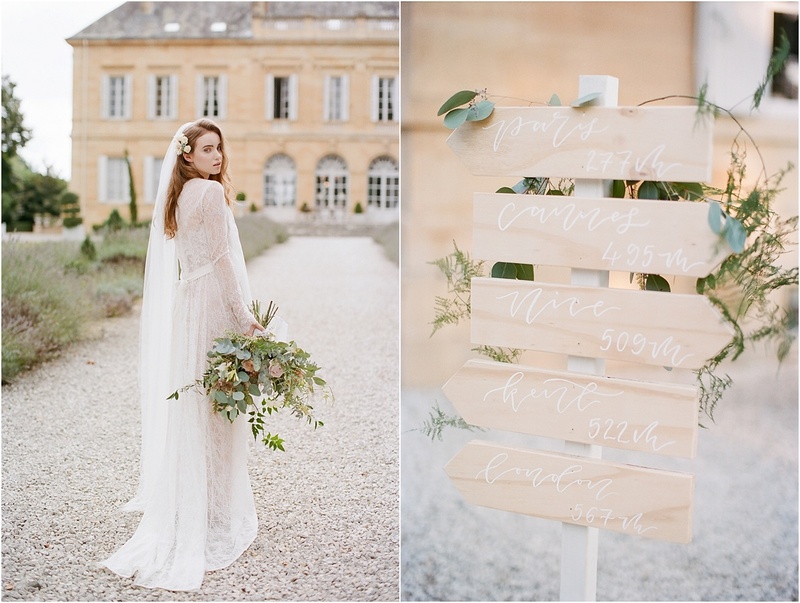 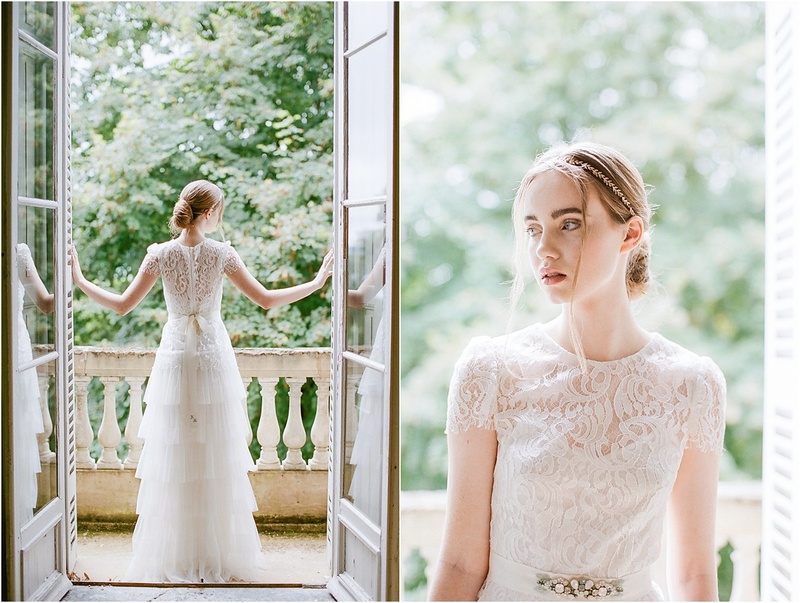 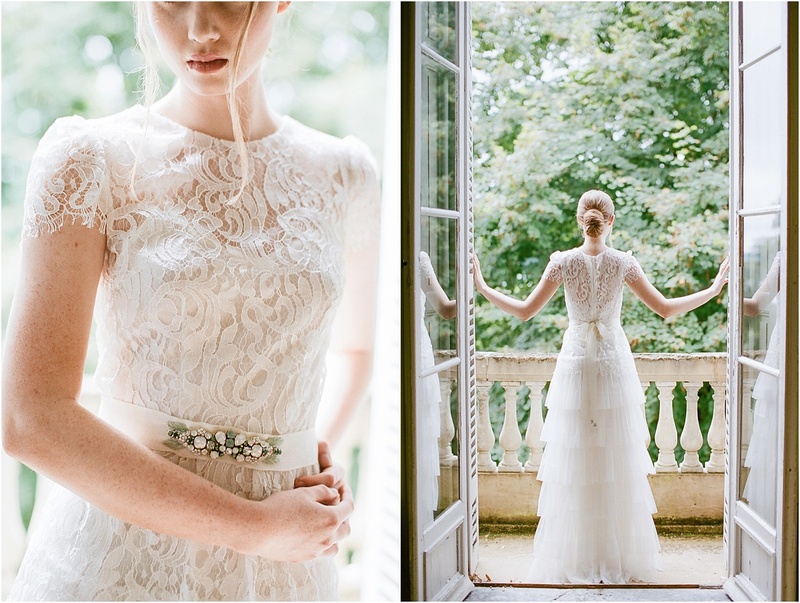 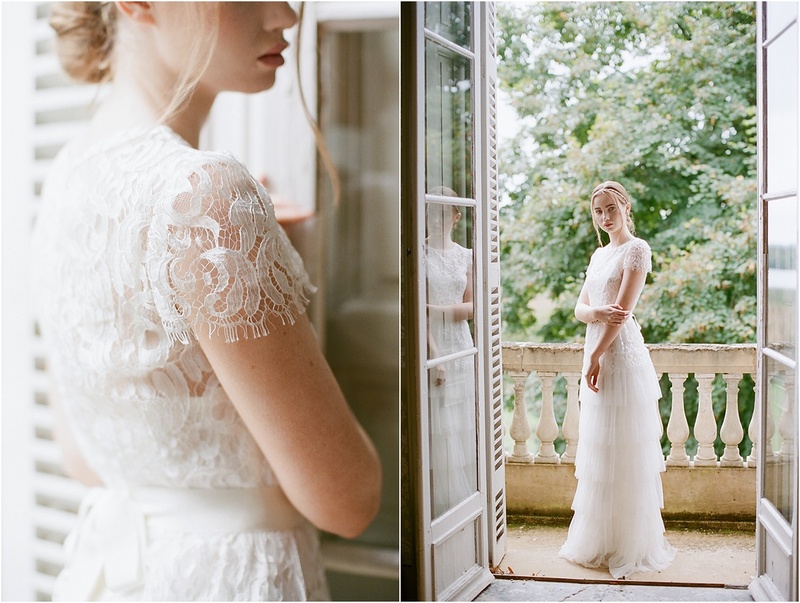 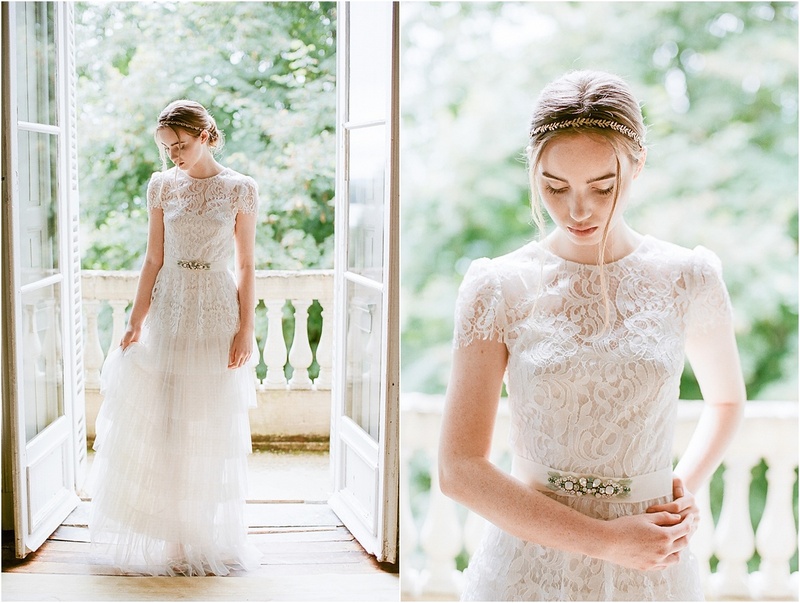 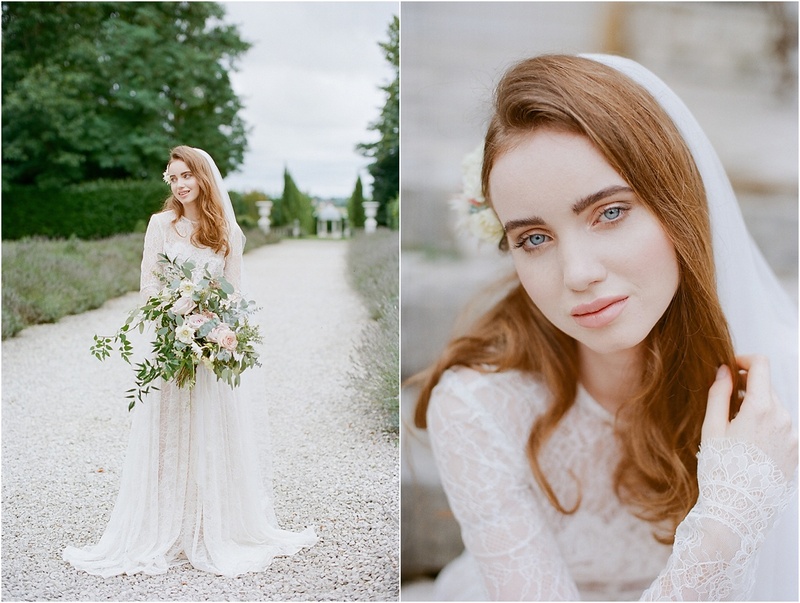 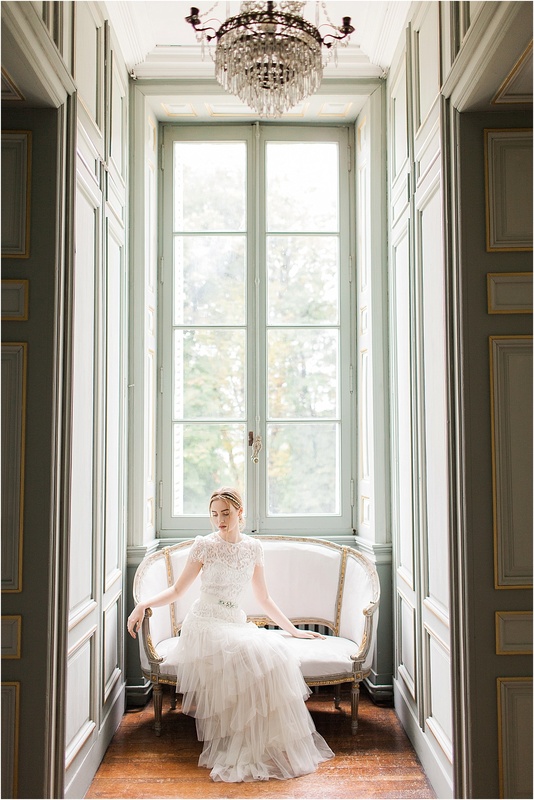 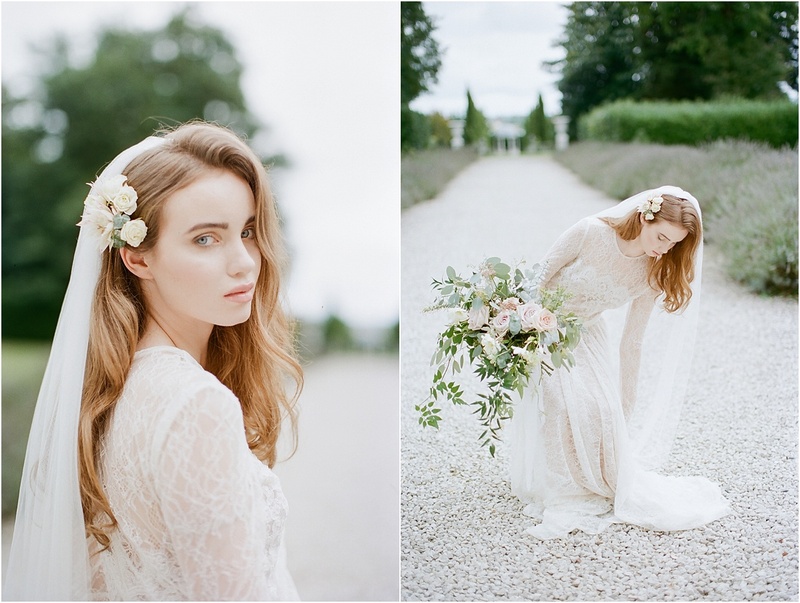 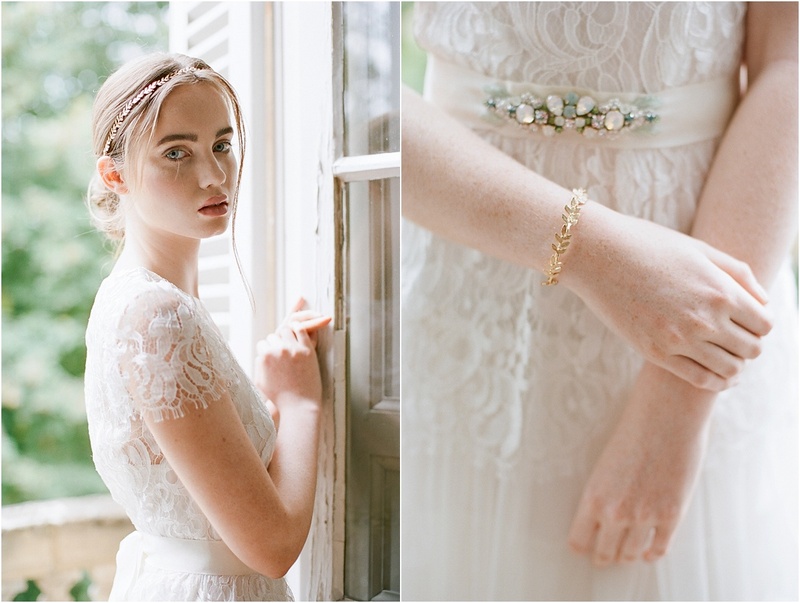 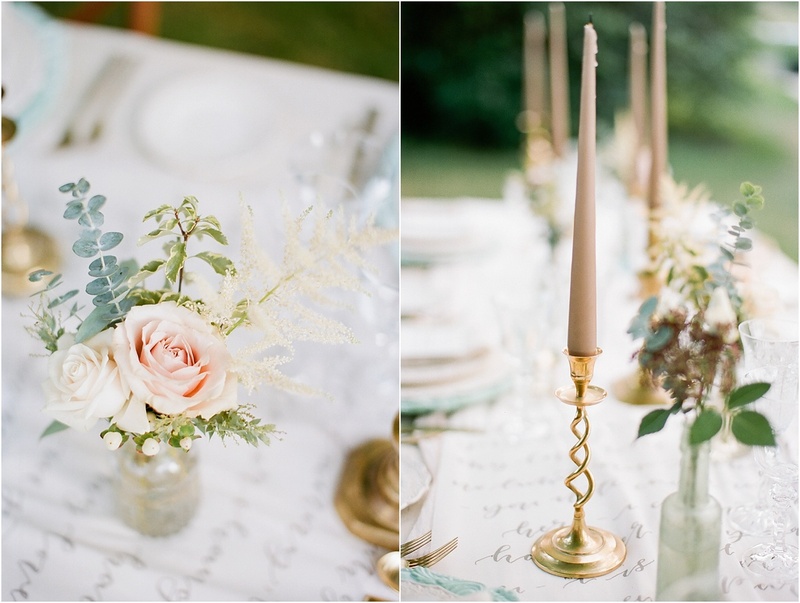 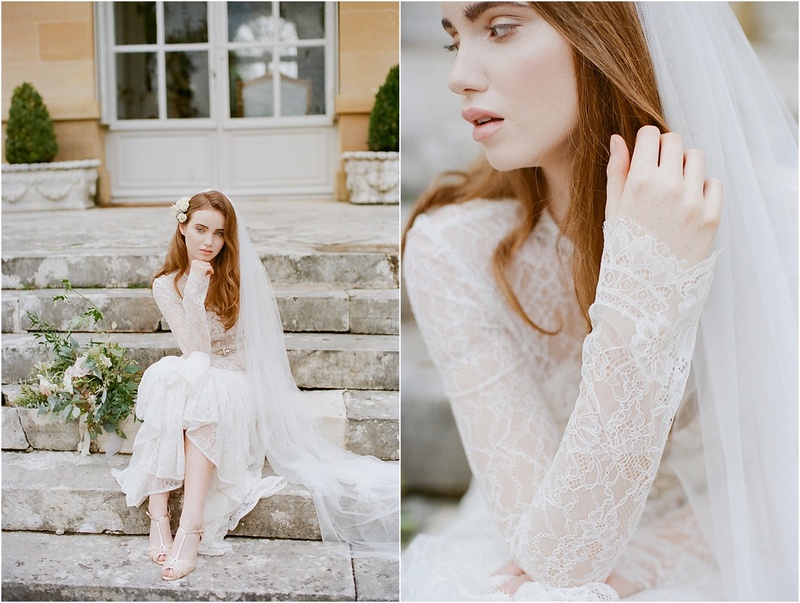 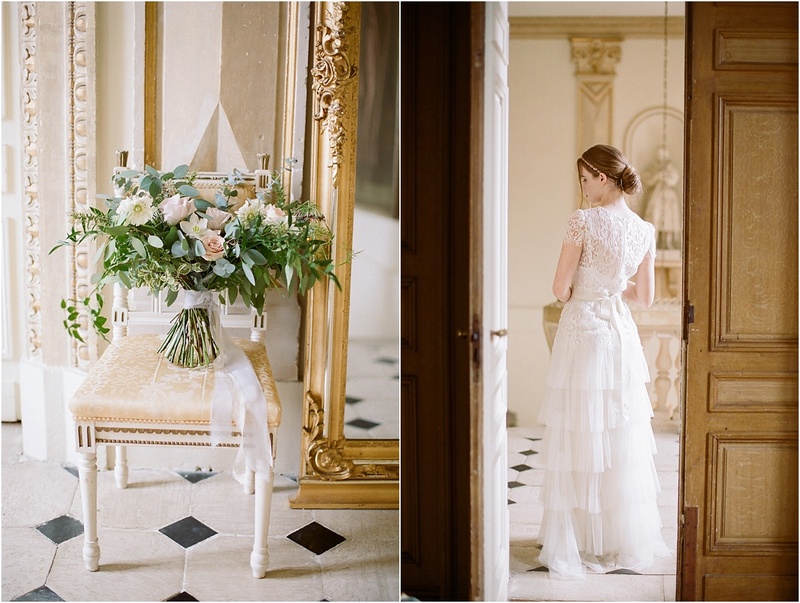 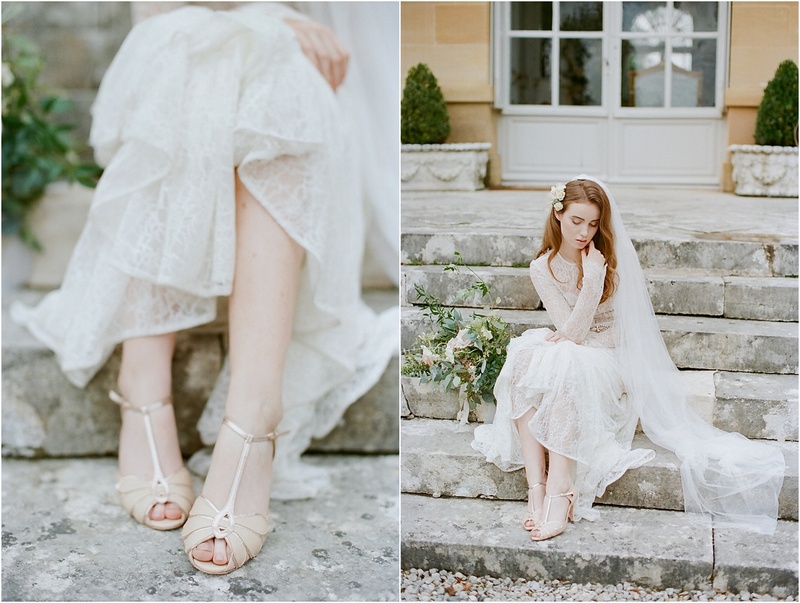 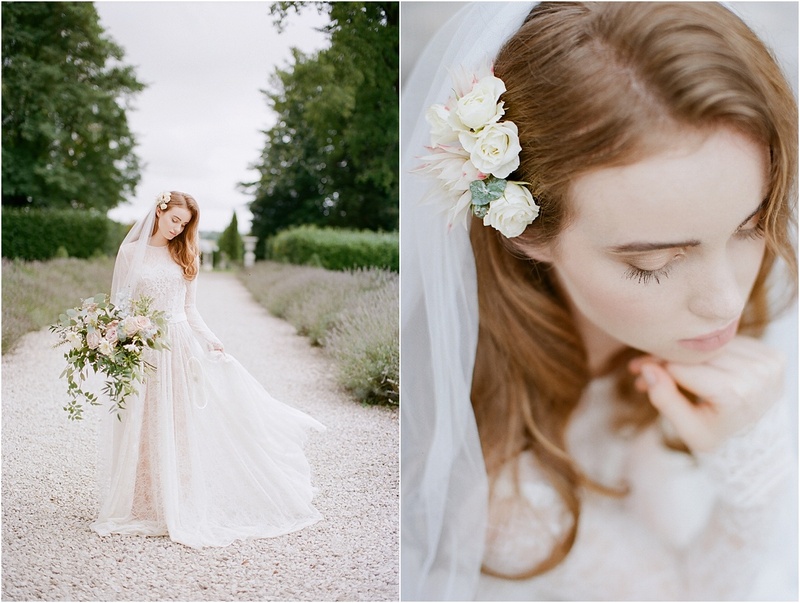 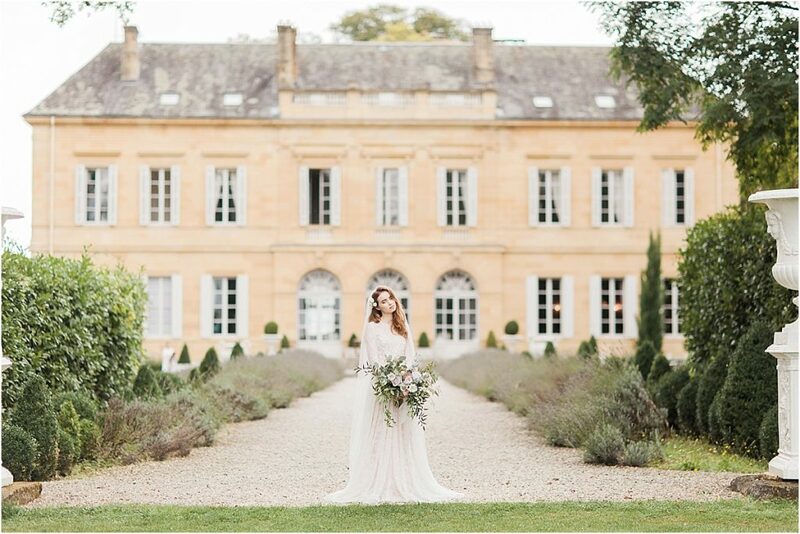 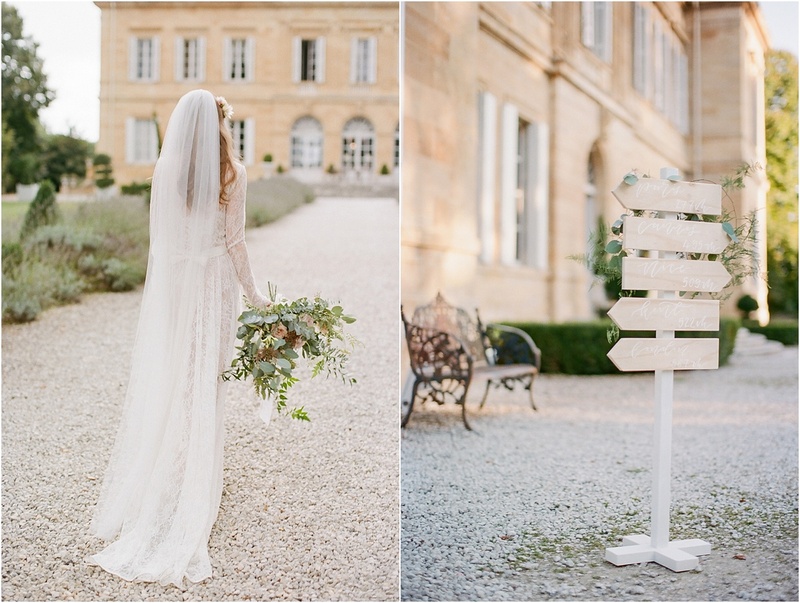 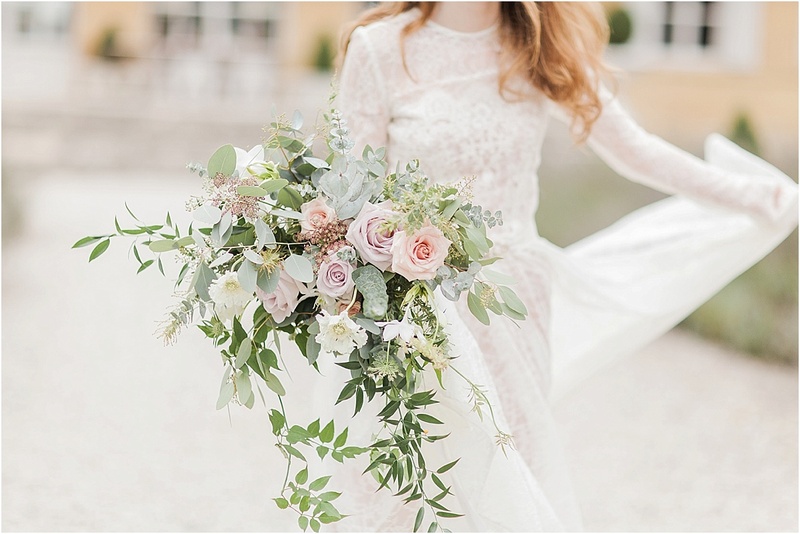 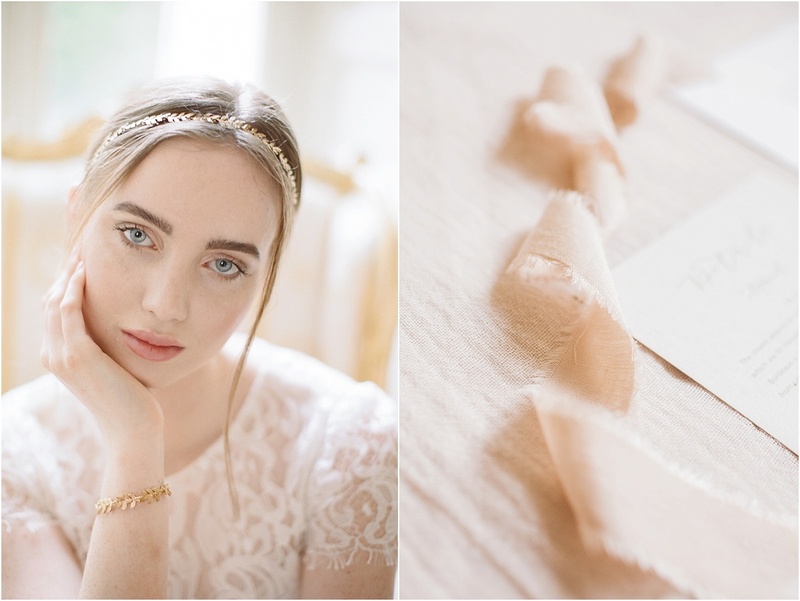 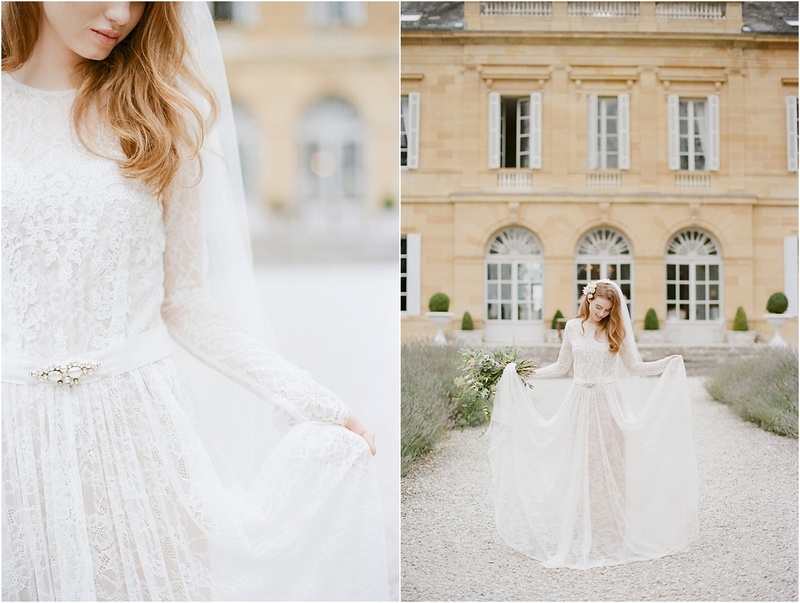 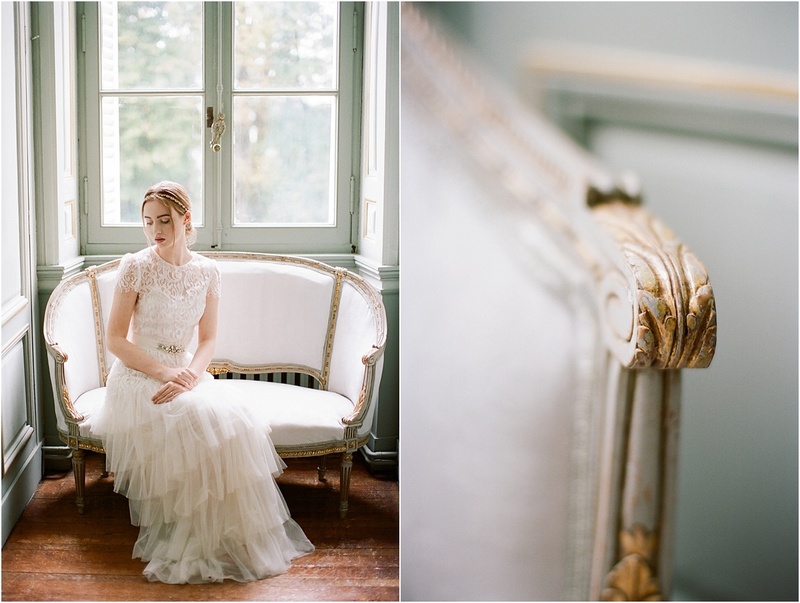 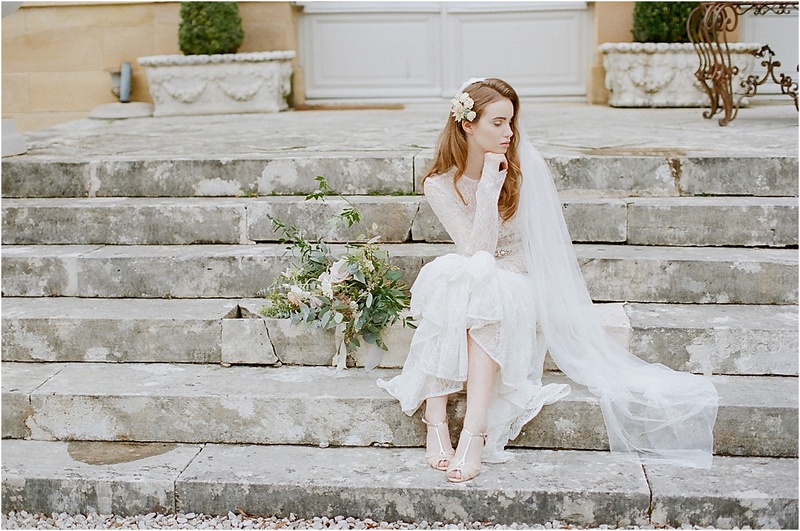 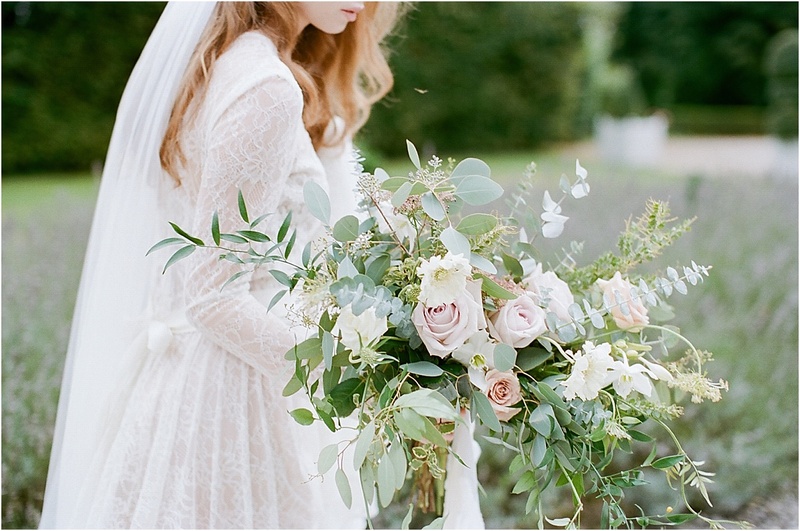 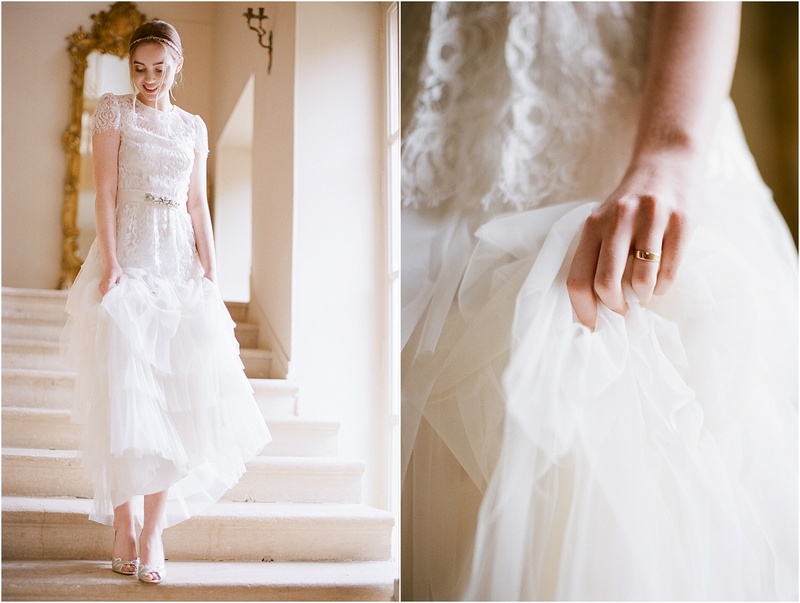 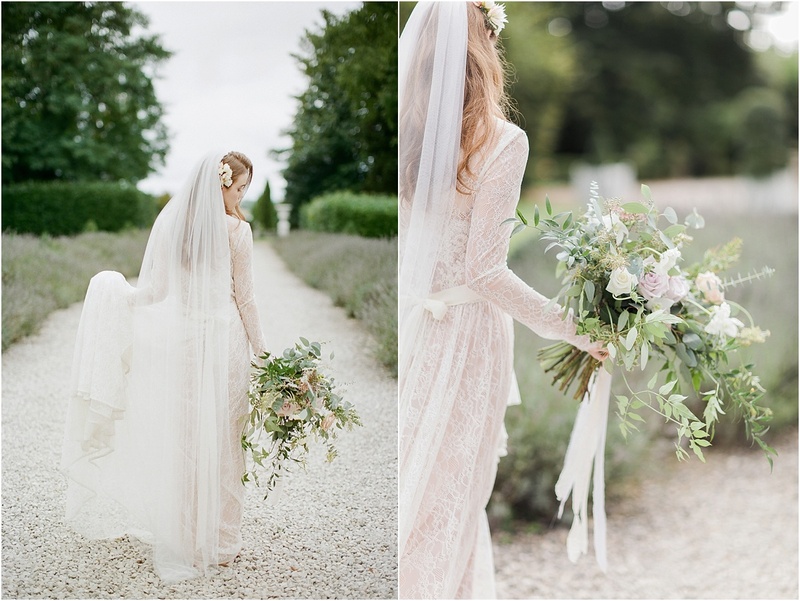 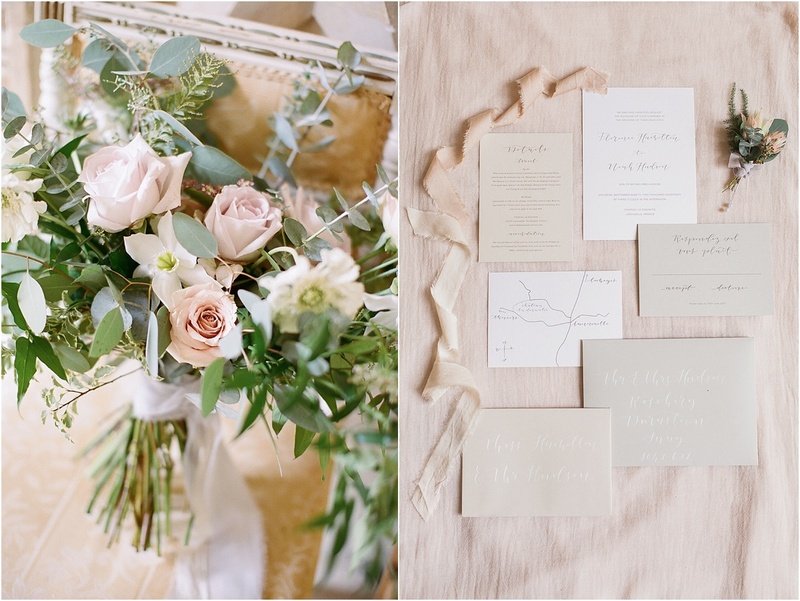 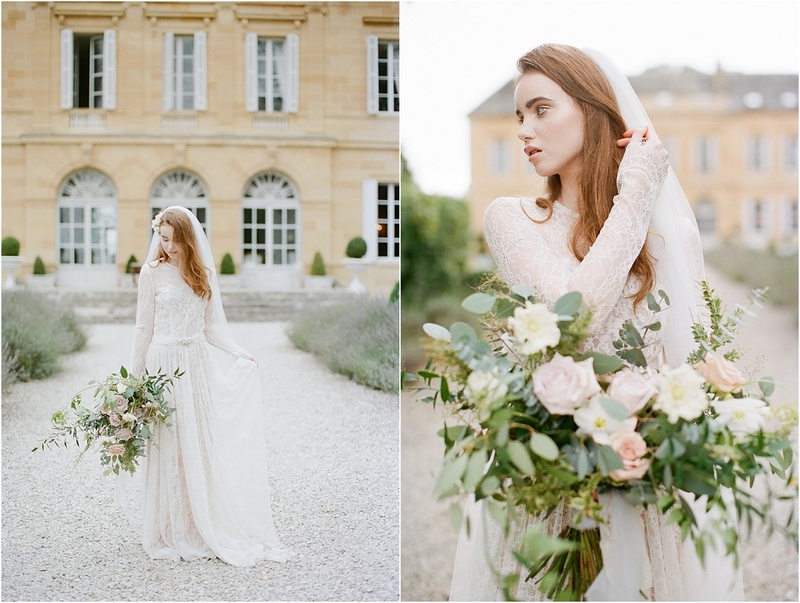 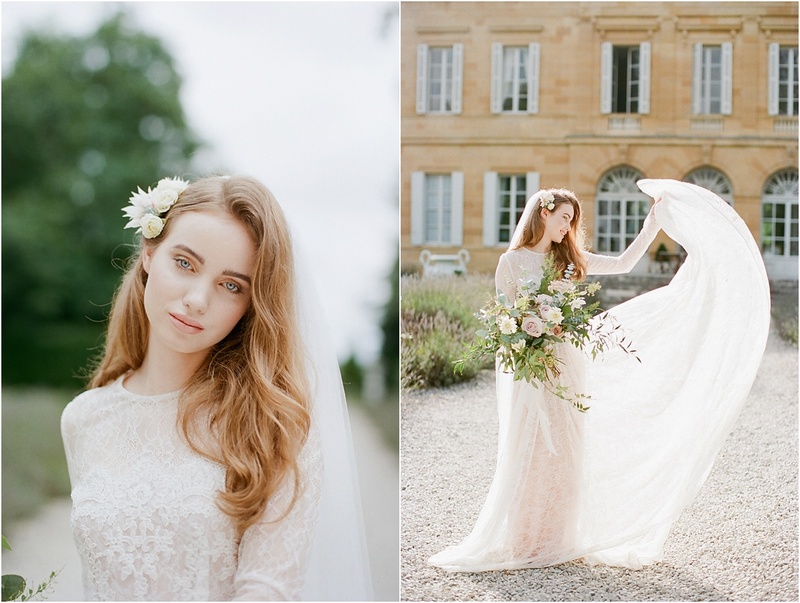 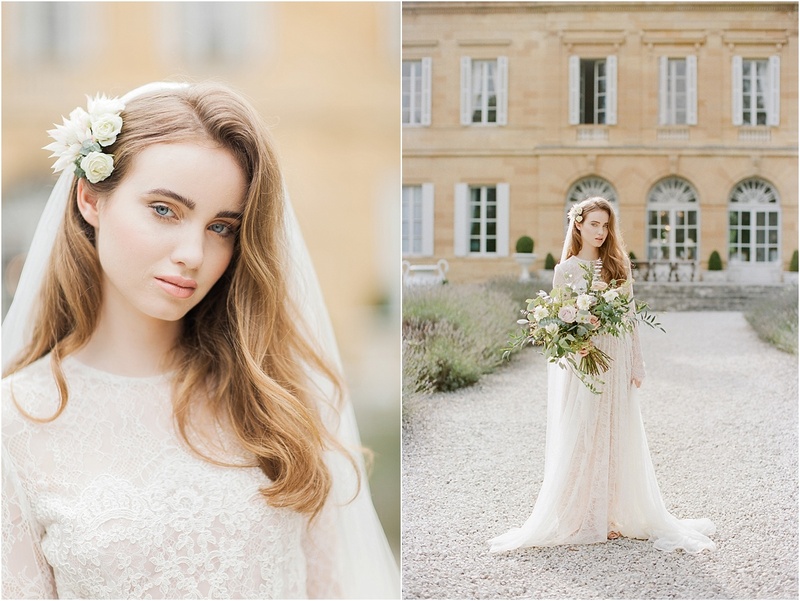 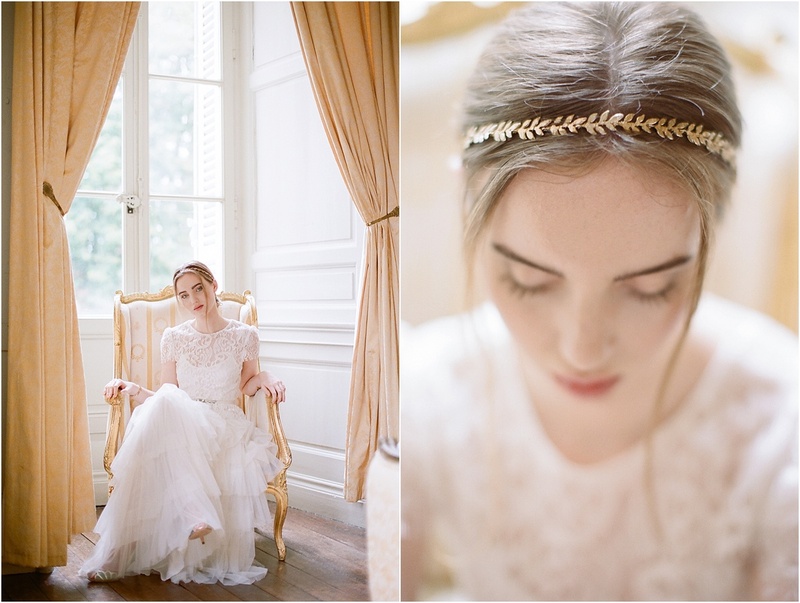 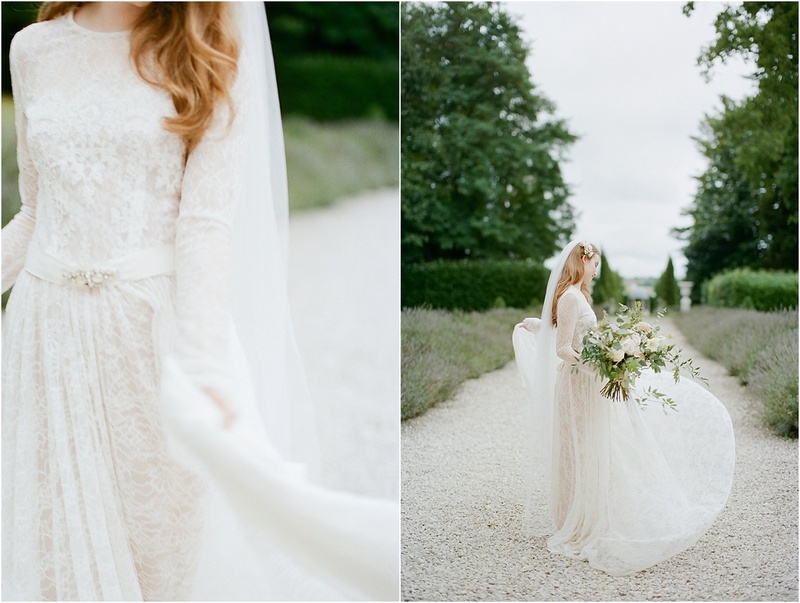 This editorial shoot was a collaboration with Helaina Storey Wedding Design, who is the in-house wedding planner at Chateau La Durantie, and it was a pleasure to photograph her beautiful styling and vision. 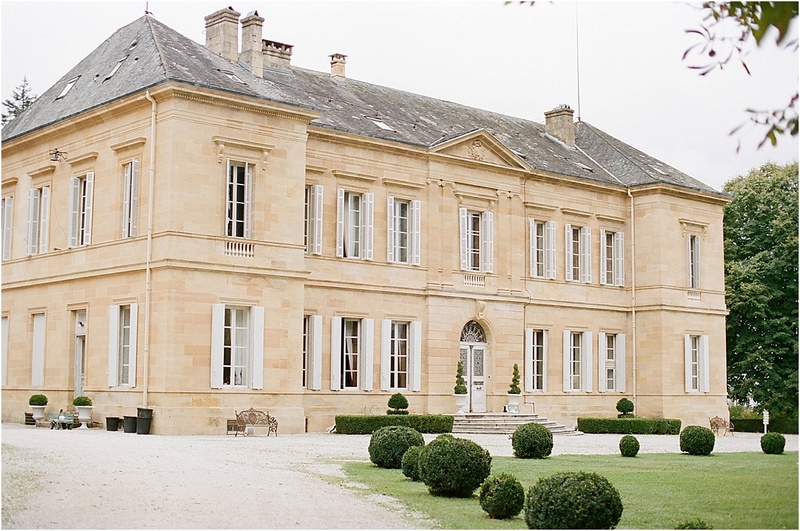 It was a dream team, bringing together fabulous local suppliers from France along with talent from the UK. 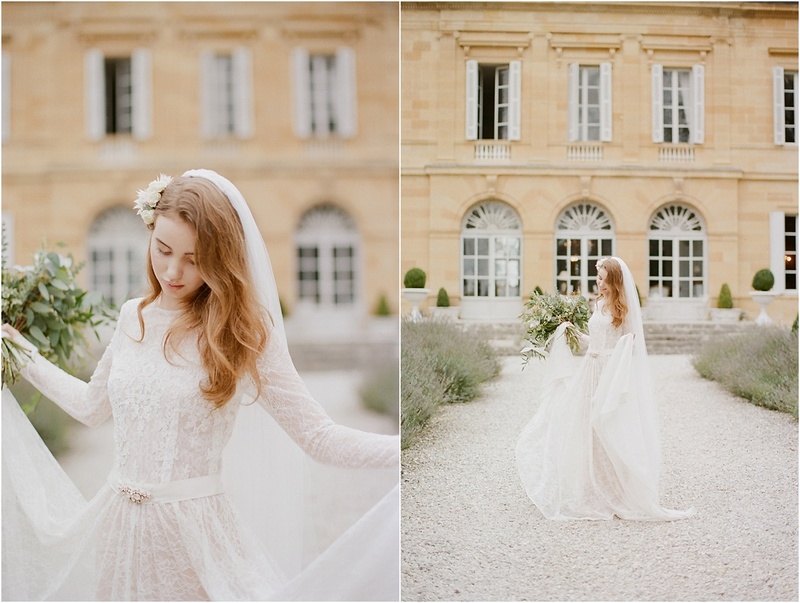 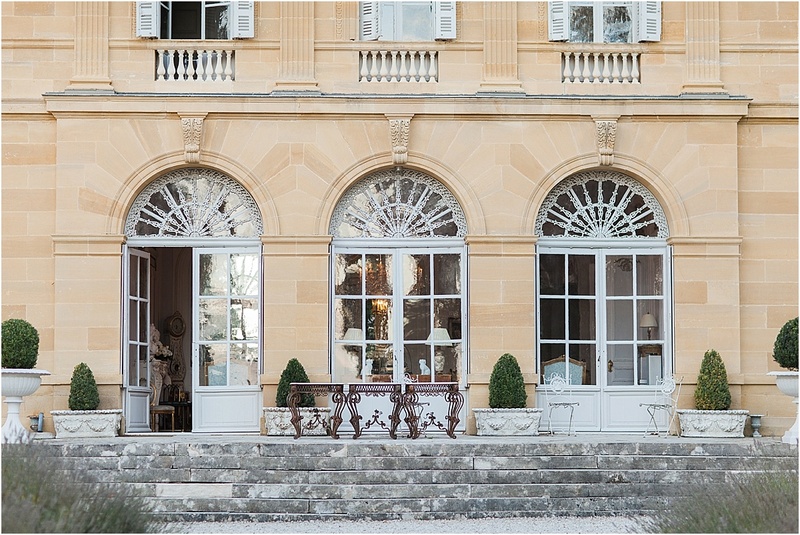 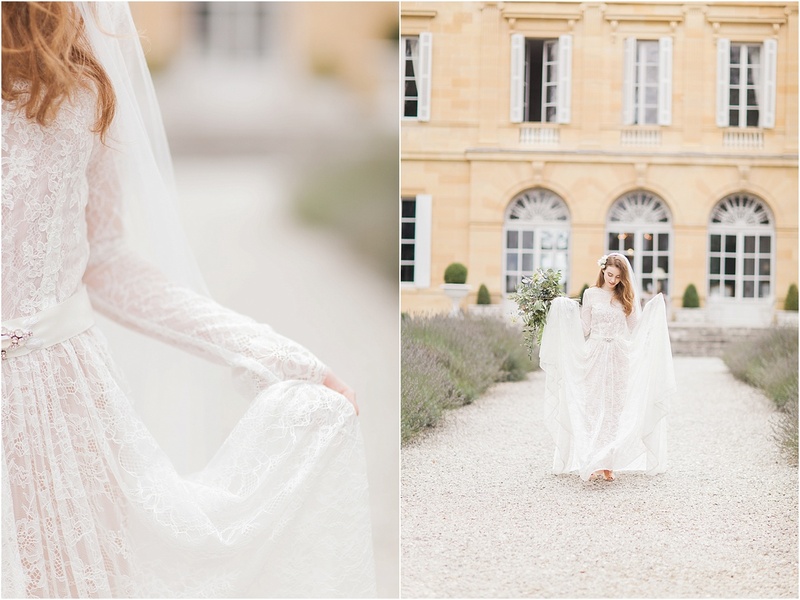 There were a number of beautiful looks and themes during the day, so I have divided the shoot into a few different stories which I hope will give you a flavour of a wedding at this stunning chateau. 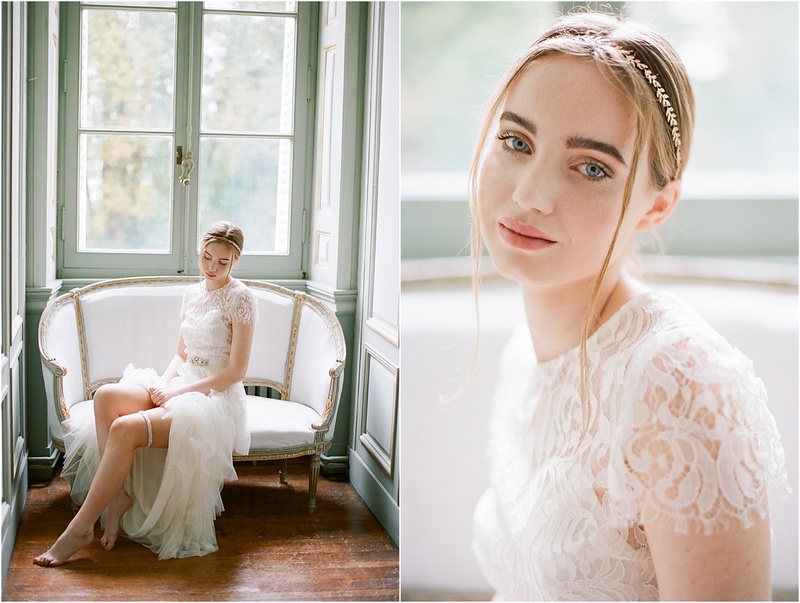 Firstly, we have Millie, a beautiful red-haired bride, nervous with anticipation on the morning of her wedding, gets ready in the elegant bridal suite. 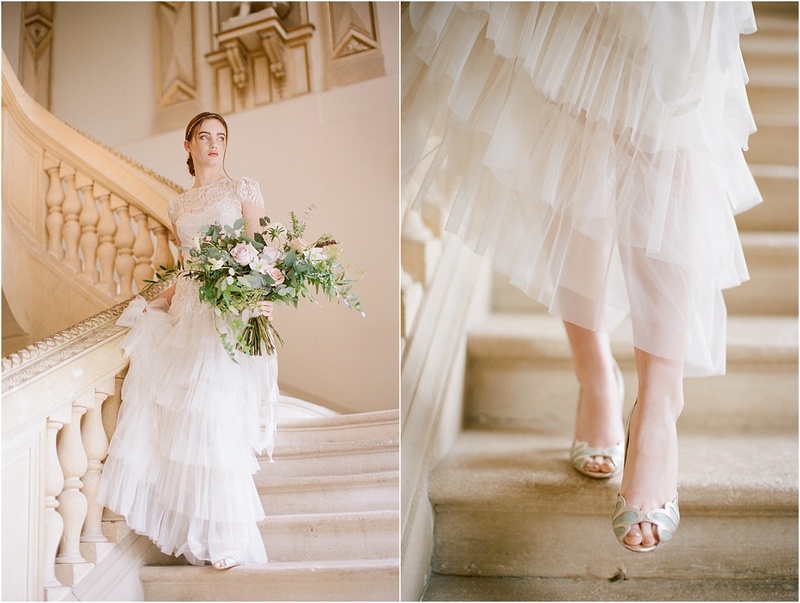 There is a hint of bridal boudoir, showing off her pretty garter and shoes, before she makes her entrance down the chateau’s grand stone staircase. 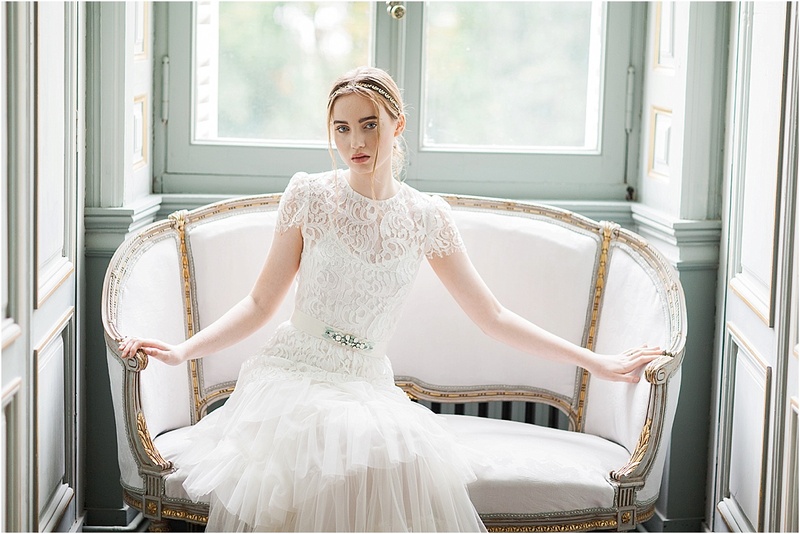 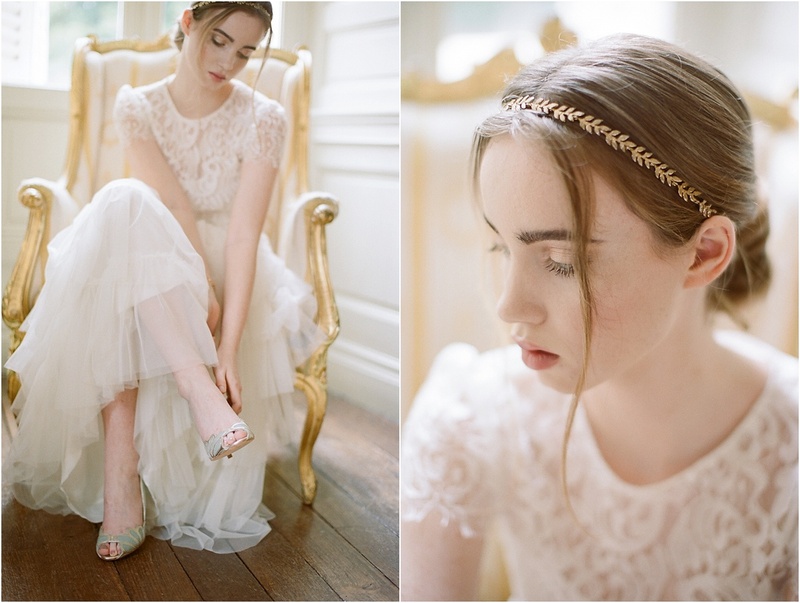 She wears two beautiful dresses by designer Katya Katya – the first, with its cap-sleeve lace bodice and layered tulle skirt, has a playful yet elegant feel, and is teamed with an exquisite beaded sash with soft aqua stones, perfectly complimenting the tones of the chateau interiors, as well as her pretty Rachel Simpson shoes. 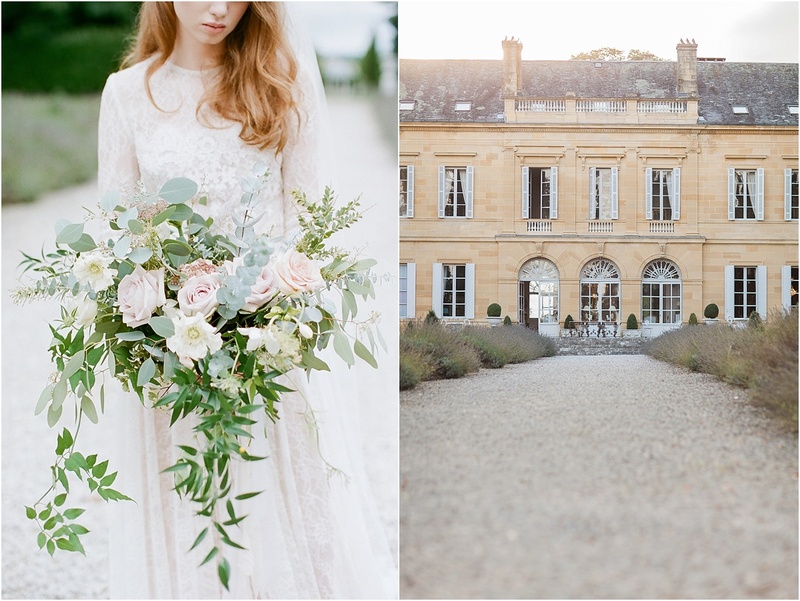 Of course, every romantic French wedding needs equally romantic, elegant stationery. 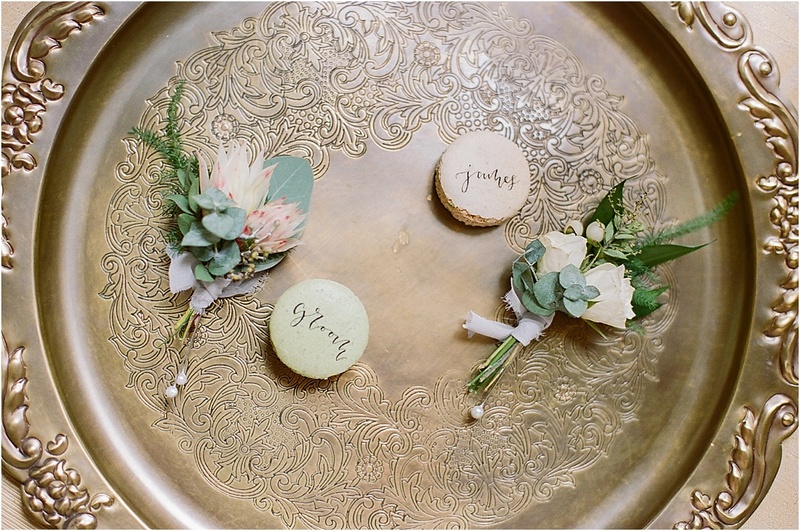 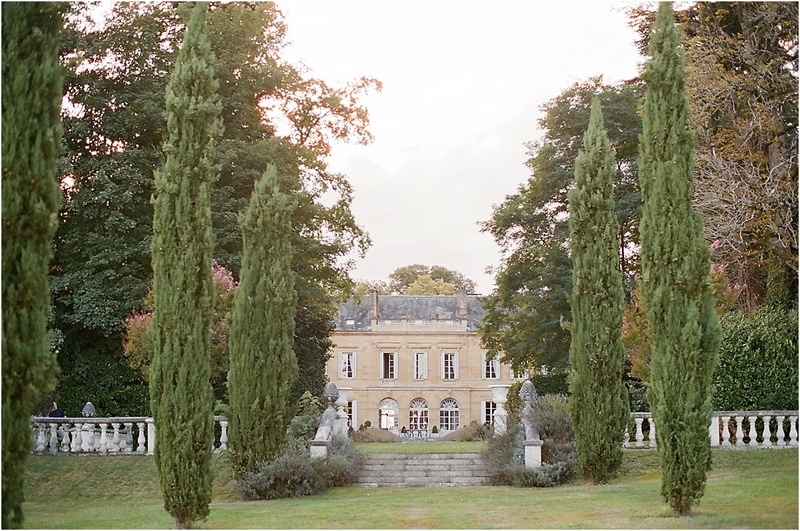 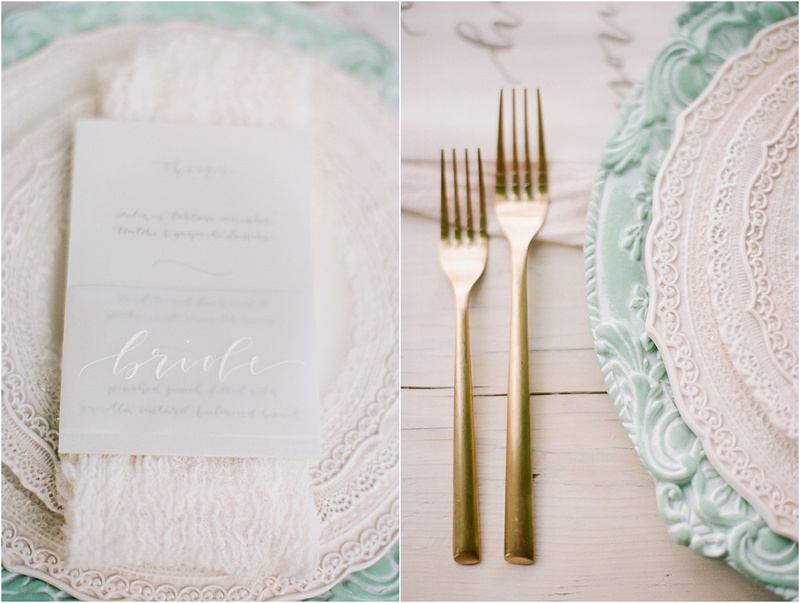 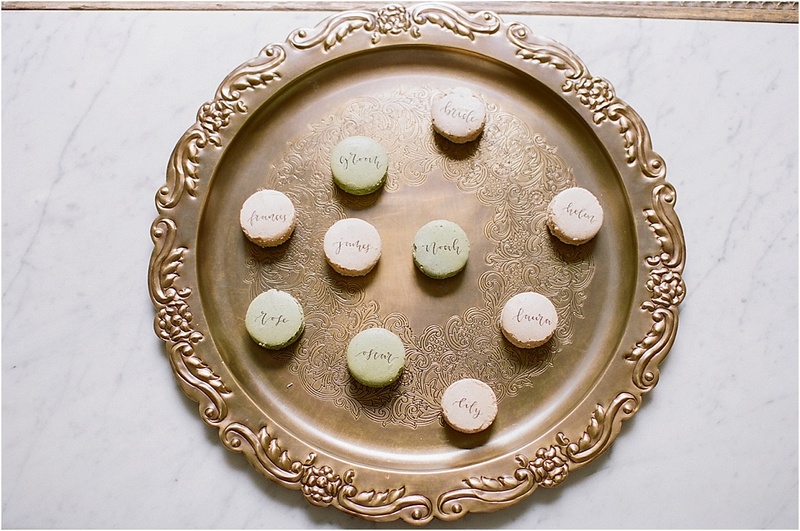 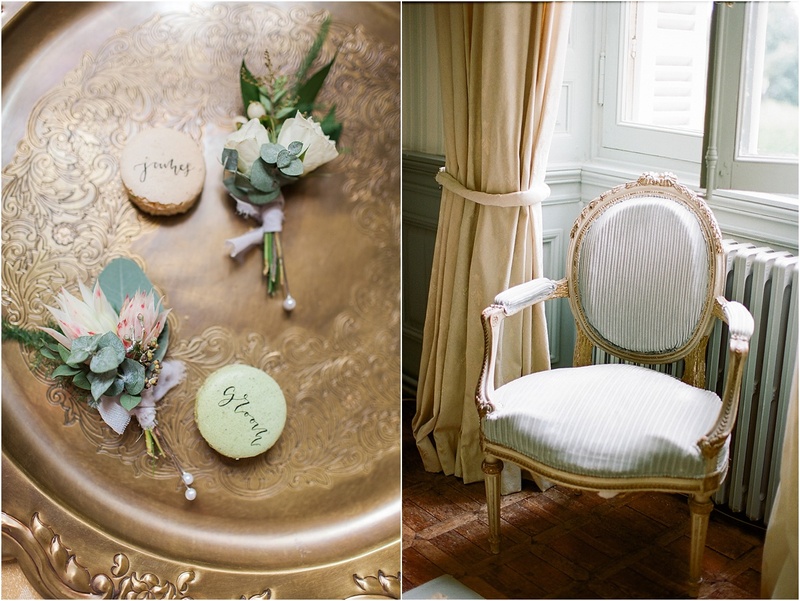 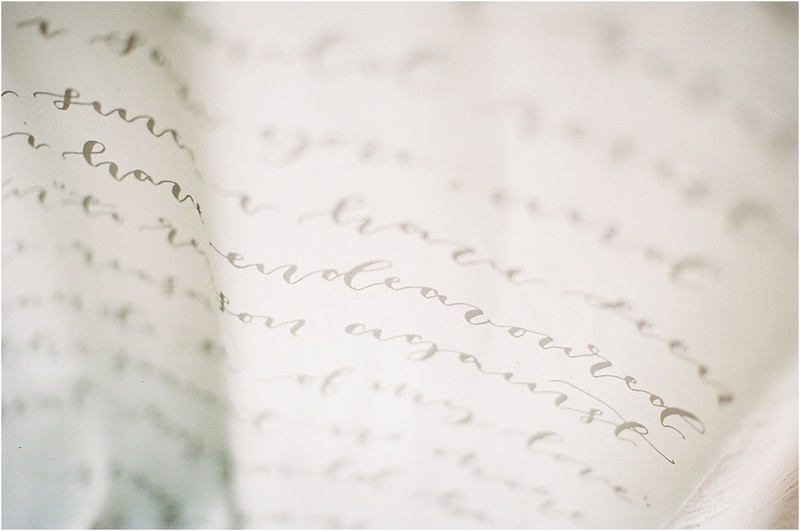 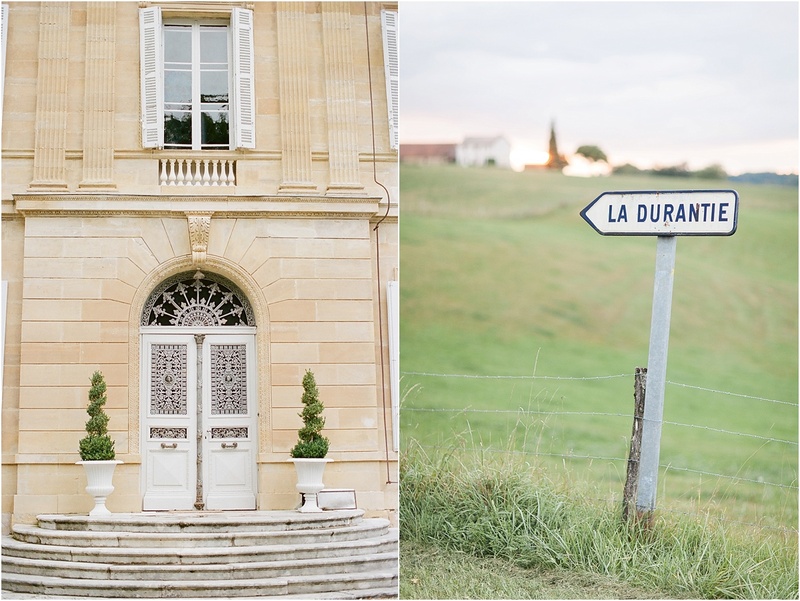 Featuring beautiful calligraphy by Oh Wonder Calligraphy, those gorgeous pale chalky grey-green tones, and the most adorable personalised Ladurée macarons, the invitations set the tone for our French chateau wedding. 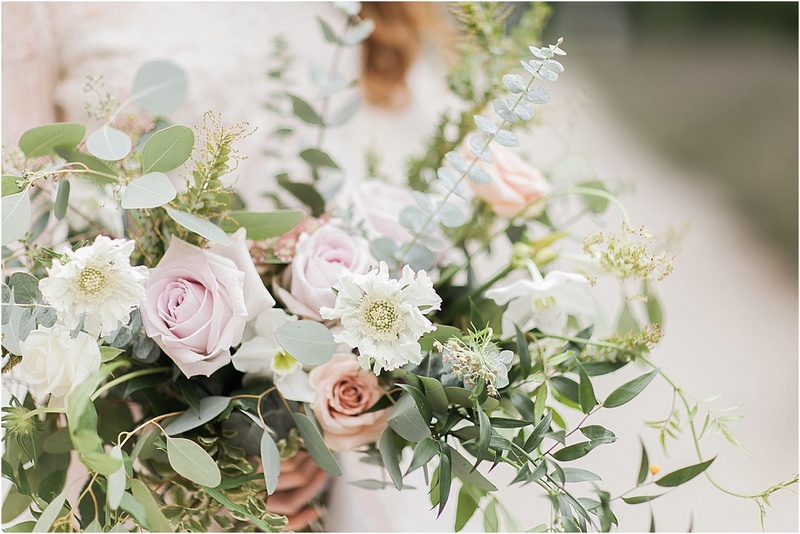 Our florals are wild and whimsical, country meadow-style bouquets with roses of the softest pink and an abundance of lush foliage. 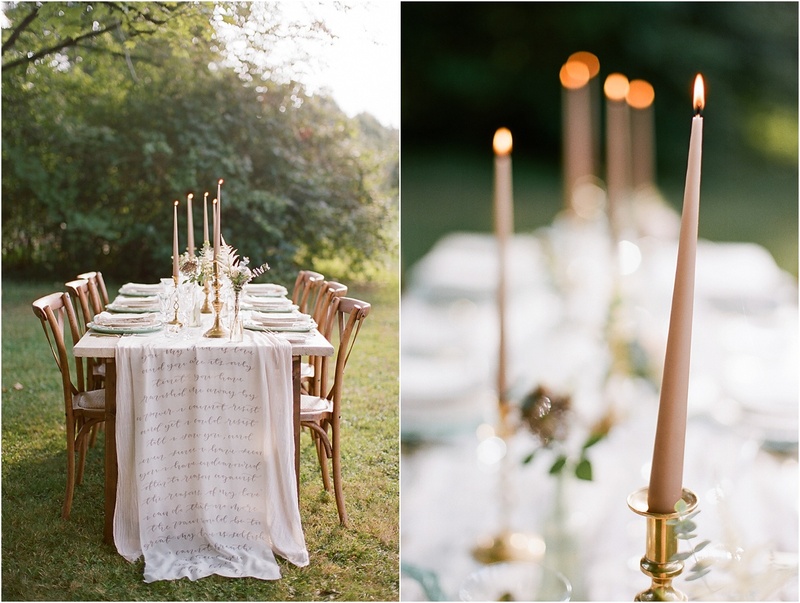 Dinner is al fresco – bien sûr, nous sommes en France! 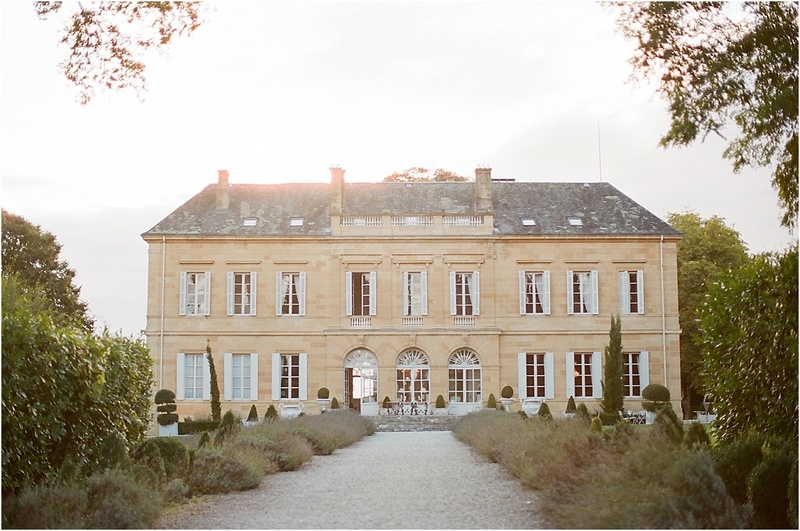 – in a quiet shaded corner of the chateau gardens, with views of the sun-filled orchard. 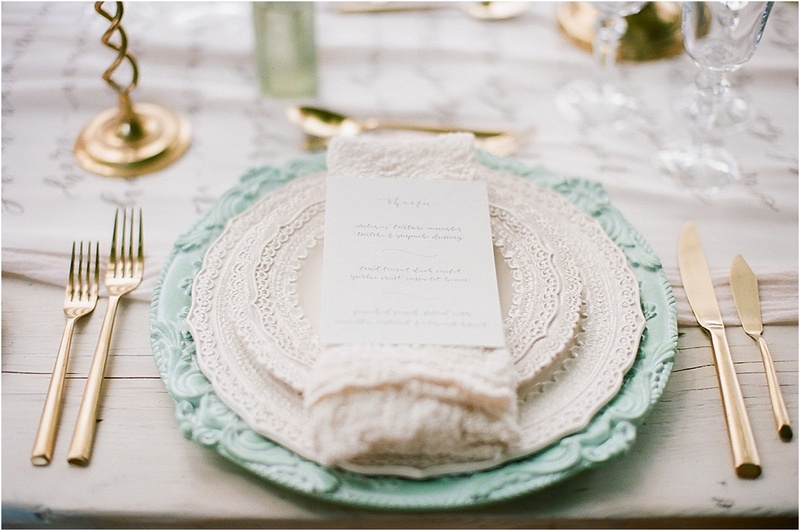 The table decor mirrors the subtle opulence and romance of the chateau setting – dressed with layers of linen in soft, textured neutrals, with exquisite aqua-toned charger plates, lace-detail china, gold cutlery and the most stunning bespoke hand-calligraphed table-runner cascading over the table. 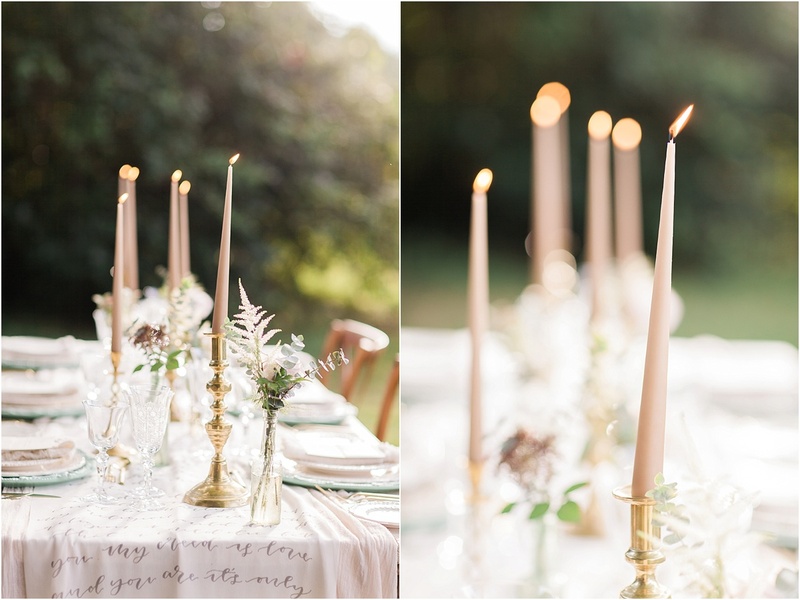 Taper candles in an alluring shade of dusky mink and delicate florals finish the setting. 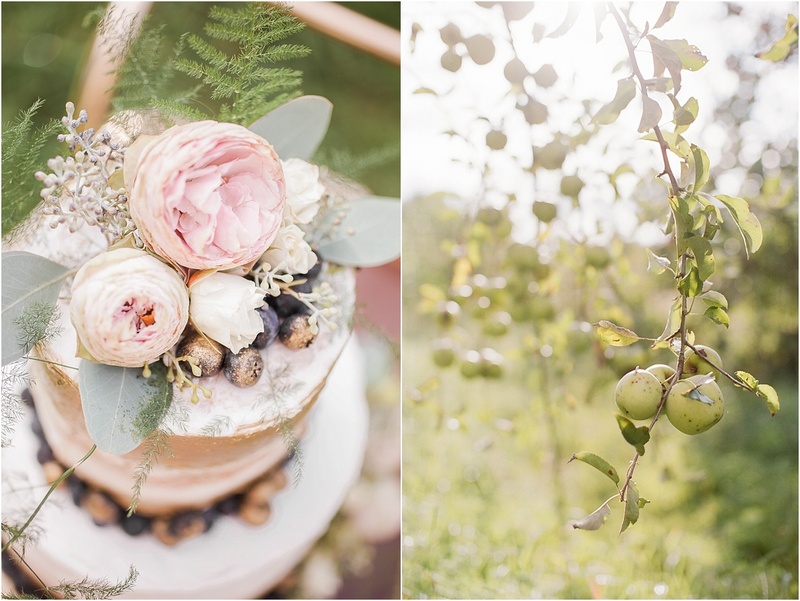 The cake – oh the cake! 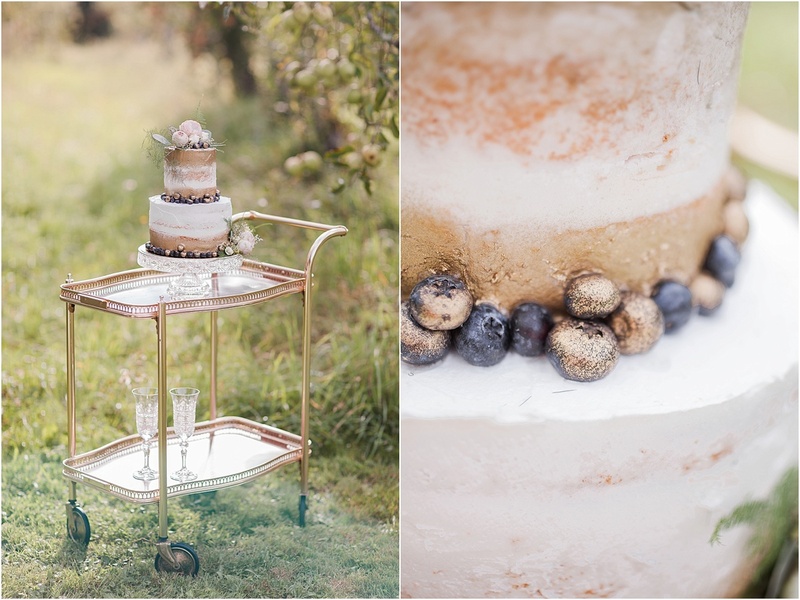 – a delicious creation, dusted with gold leaf and decorated with blueberries, finished with delicate flowers and displayed on an antique gold hostess trolley in the orchard. 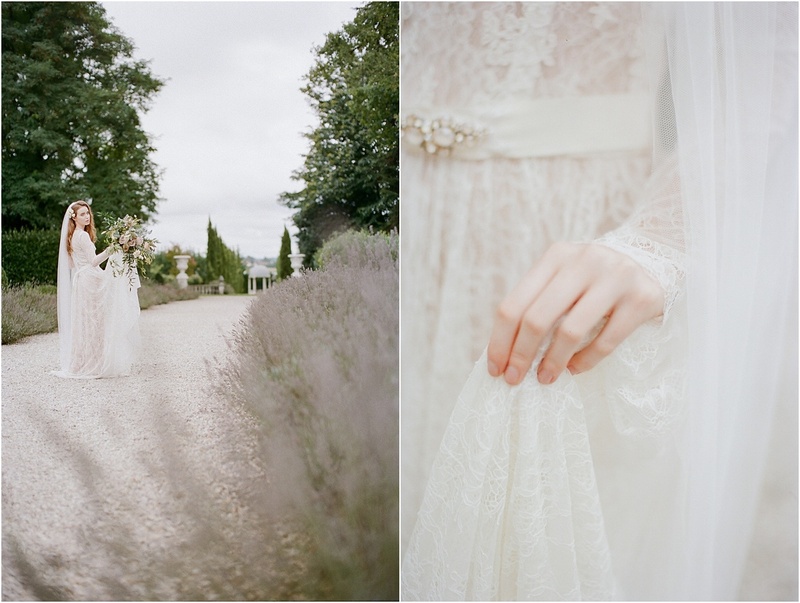 After dinner, our bride wears her second dress – a flowing, bohemian gown made entirely of exquisite French lace, with a hint of soft blush. 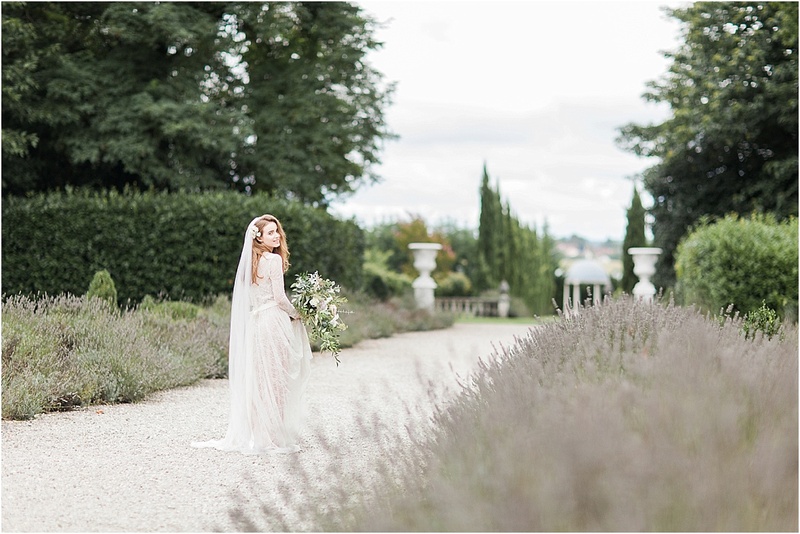 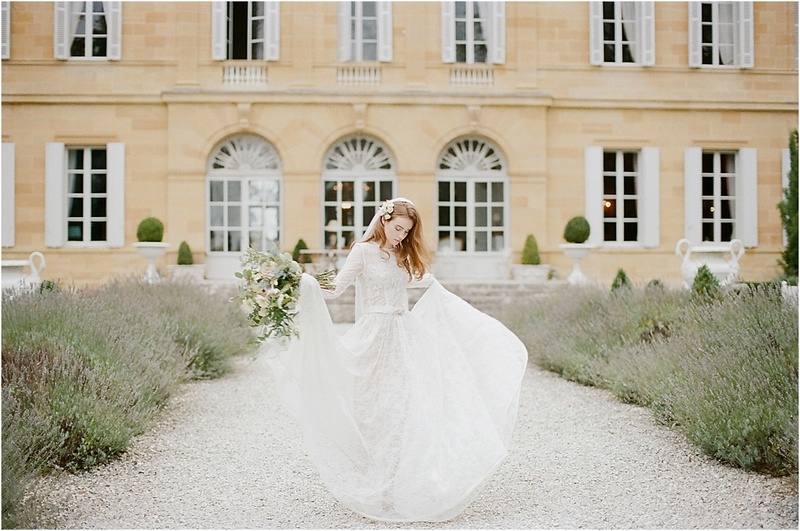 Her auburn hair is loose and tumbles around her shoulders as she dances along the lavender-lined aisle, the cypress trees in the distance reminding us of our South of France location. 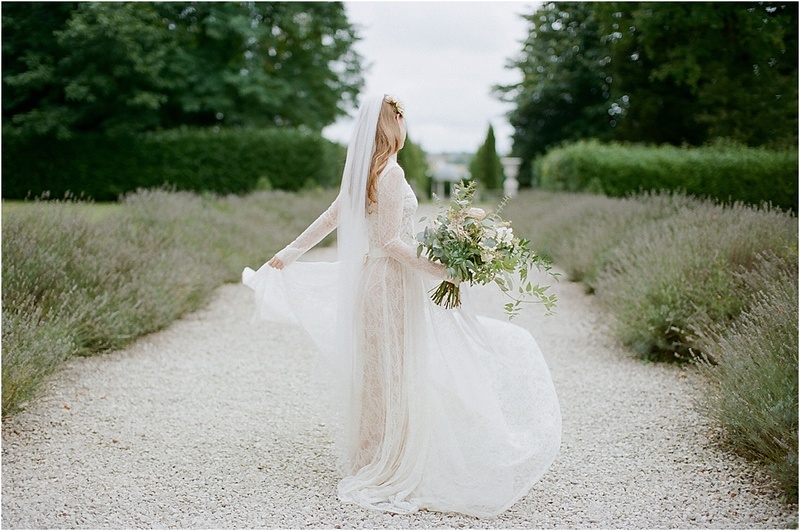 She is a whimsical and wild bride, a free-spirit, excited to be setting out on a new adventure with her soul mate and love. 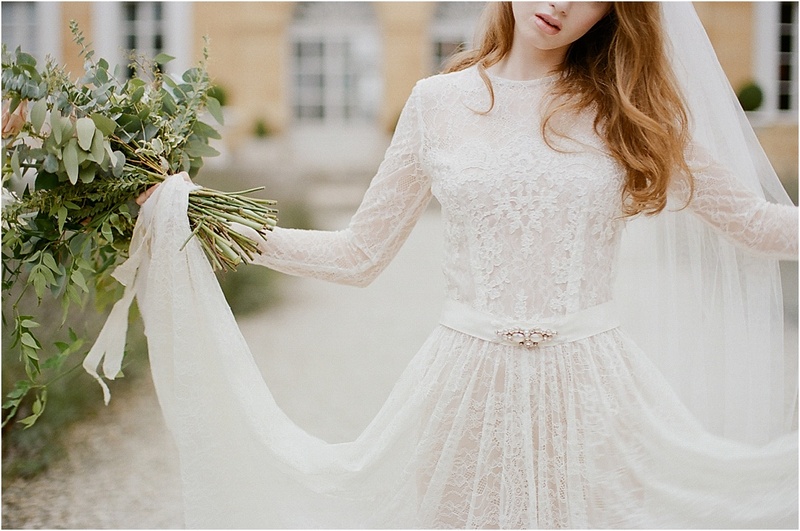 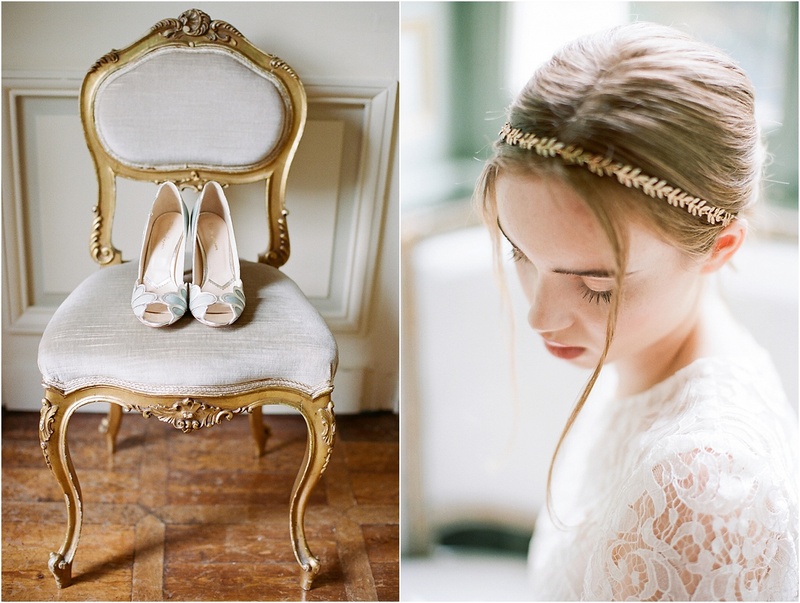 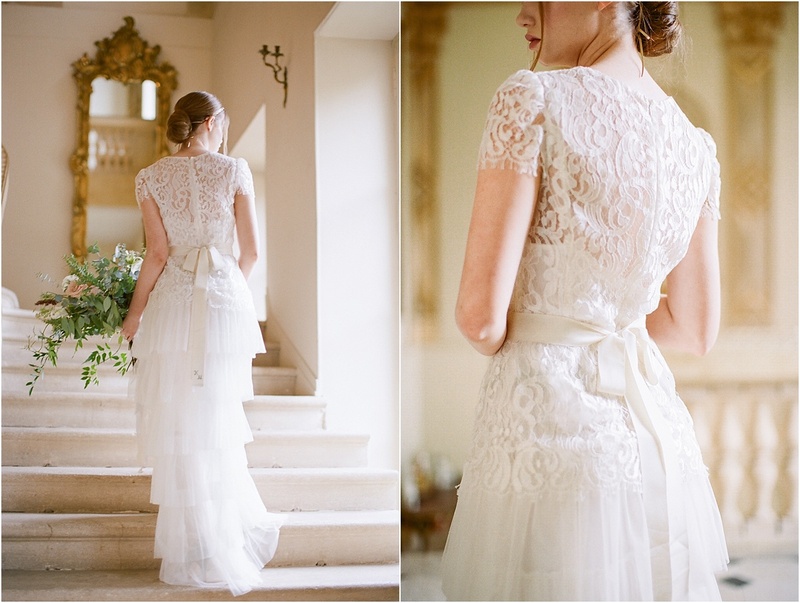 Veils & Accessories: Britten Weddings | Garter: The Wedding Garter Co.
How wonderful! 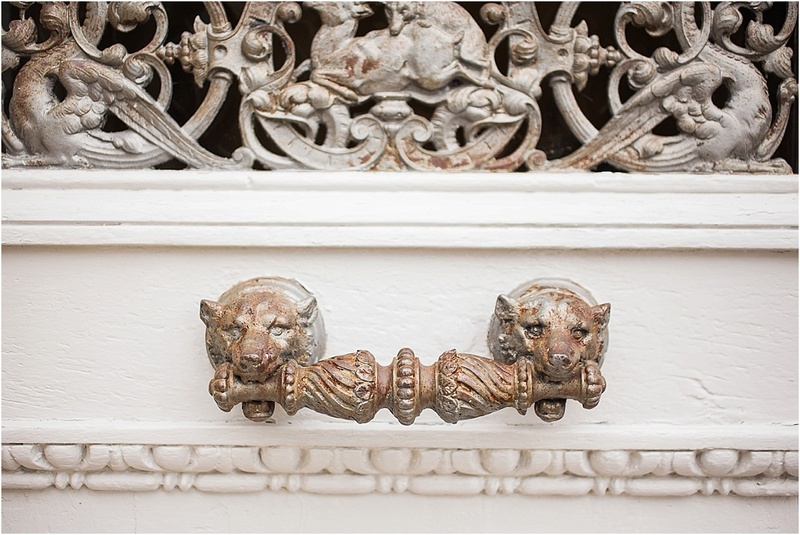 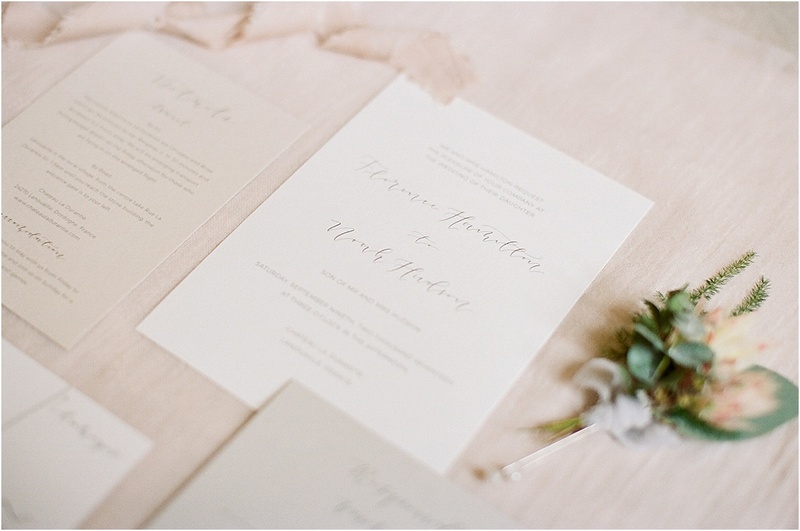 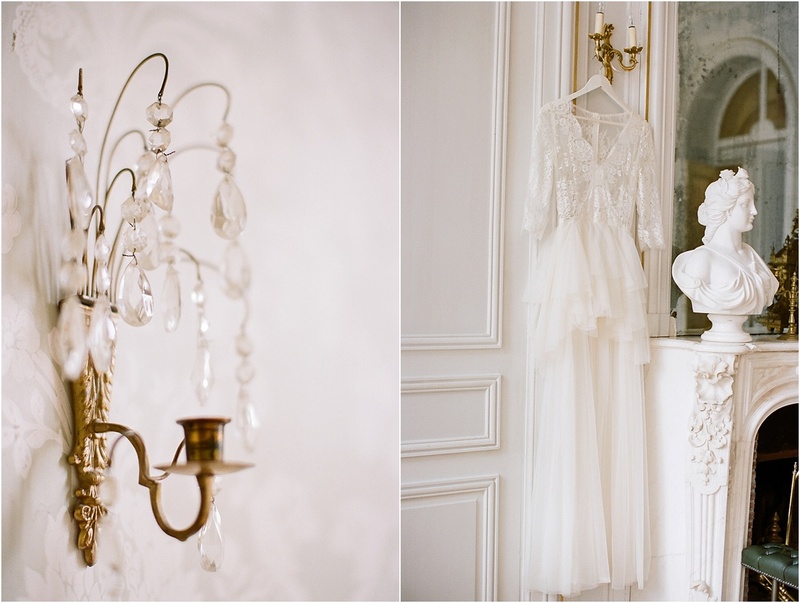 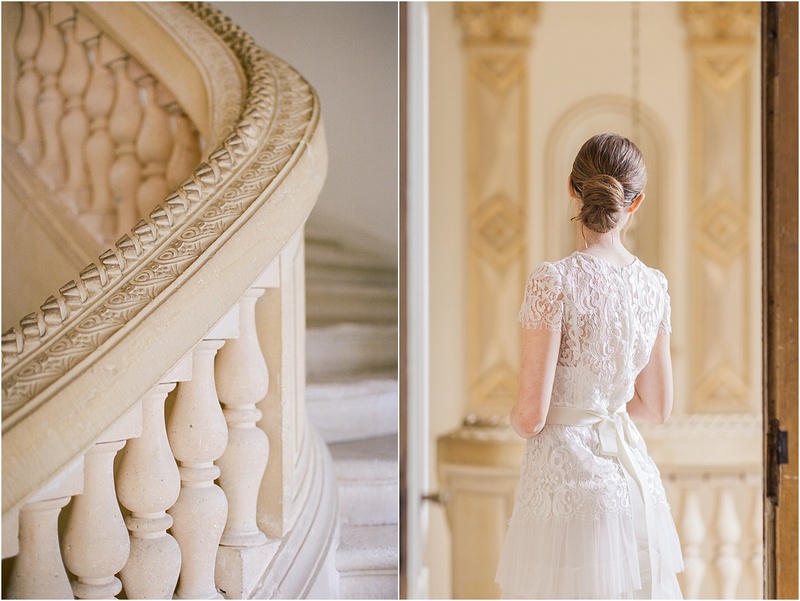 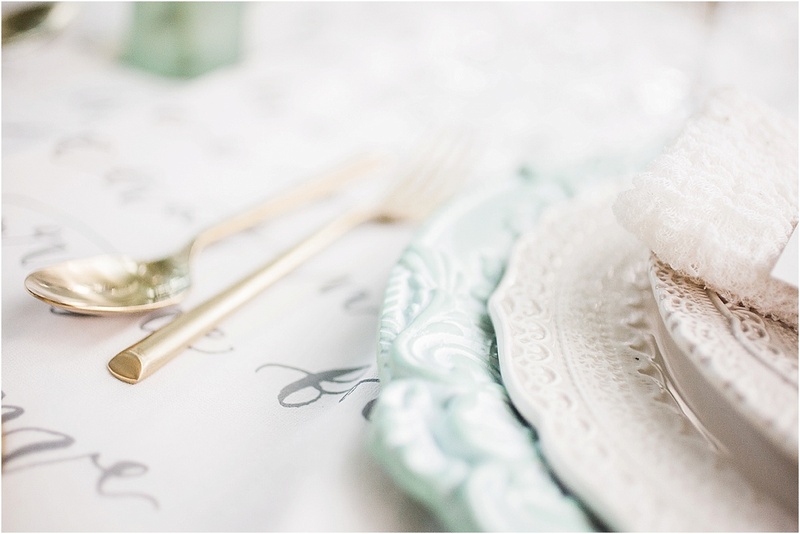 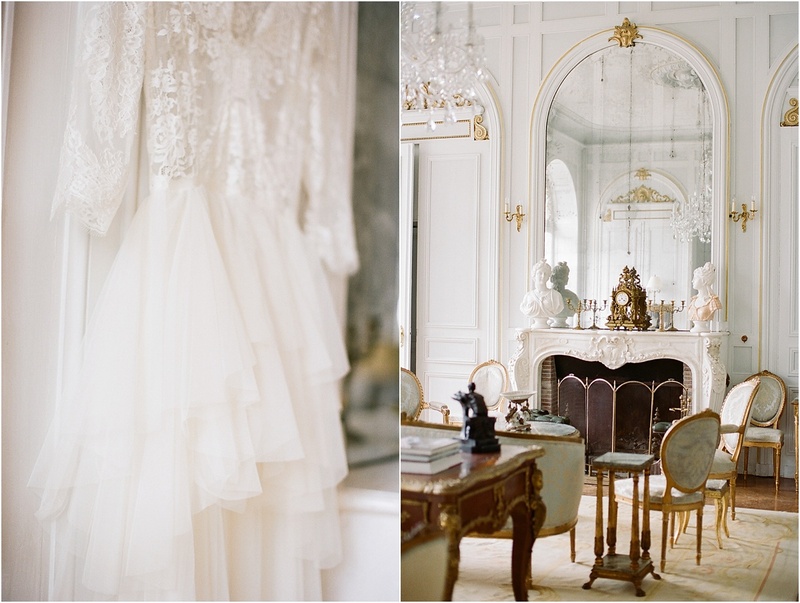 Beautiful photography of exquisite venue and charming details in every respect!